HER latest single ‘Rose in the Concrete’ is making waves on the music scene right now and deservedly so! Buoyed this initial success, exceptionally-talented Cleveland, Ohio born singer Nicole Marie is currently on what she termed a ‘radio tour’ to promote the song. 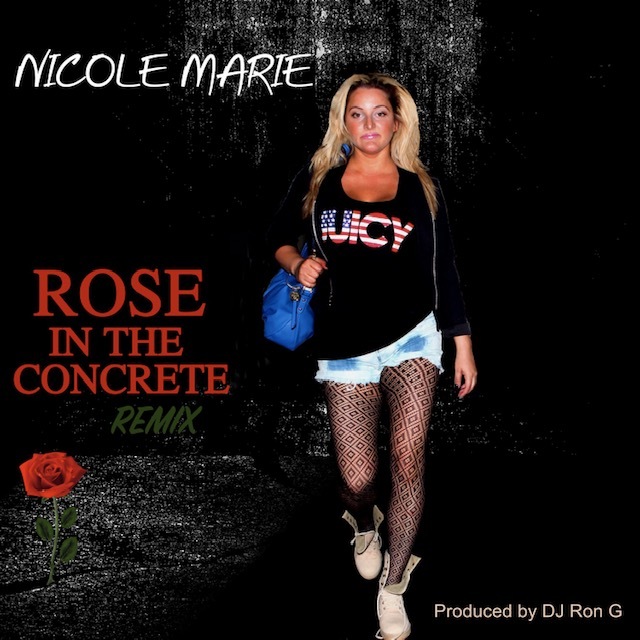 “My new single ‘Rose in the Concrete’ (REMIX) is taking the nation by storm, which is a blessing. It’s available on all streaming platforms and is enjoying heavy spins on national radio. “I am currently on the road with my #Runitup Radio Tour for the new single which was produced by DJ Ron G. I have been visiting hundreds of radio stations from Cleveland, New York, Miami, and the list goes on. I also have new visuals for the single that will be released soon, directed by Coach K Exclusive and J Ham Films”, said Nicole. Urban Craft magazine used this rare opportunity of chatting with the singer/songwriter, producer and pianist to find out a bit more about her journey in the industry and she was all too happy to oblige us! “I grew up listening to Anita Baker, Earth Wind and Fire, Shalamar, Elvis Presley, The Carpenters, Stevie Nicks, Guns and Roses, Hall & Oates, Mary J. Blige, Music Soul Child and many more. I have been working my way up the music industry ladder with sheer determination, hard work, never compromising my morals, or dignity and staying true to who I am. My lyrics usually touch upon topics like empowerment, love, and heartbreak. My career began when I moved to New York, moving to East Harlem’s 1199 building on 110th and 1st avenue. While in New York I was knocking on doors left and right, but was left with a lot of late nights and broken promises. I realized with my brother’s help and guidance that I needed to create my own lane, that’s when I co-founded Rock Me Tv.com with him back in the day, a project that included the hit show ‘The Round Table’ with Lenny S, Mya the B, and Big Lite, and the multifaceted Gemini Keez. I remained in the background putting in the work, but this platform allowed me to create/build relationships with the right people in the industry over the course of many years”, she said. Her formative years saw her opening up for established acts back then like Fergie, NSync and Silk, to name but a few. “I recorded in the same studio as the iconic Gerald Levert (RIP) and the Rude Boys. In Cleveland I had a national released song featured on Clear Channel’s Radio Station 93.1 WZAK. I have developed into an accomplished singer/songwriter being invited to open up as a musical act for the Summer Extension Jam fest held by the largest Clear Channel radio stations in her home town. Opening up for artists such as NSync, Fergie, John B, Silk, and many other celebrities, performing for audiences with over 40,000 people. While in Cleveland I was runner-up as American Idols top 10 singers in the state, performing at the Rock n Roll Hall of fame”, said Nicole. “Magic happened when I collaborated and worked with Legendary DJ Ron G, who was the first DJ to give me a platform to display my talents not only as a singer but as a songwriter and producer. I am truly grateful for the guidance and opportunity DJ Ron G gave me. I released 4 singles with Ron G ‘Handle Your Business’, ‘Be With You” (Video directed by Cleveland’s Own Coach K Exclusive), ‘Someone For Me’ an exclusive titled ‘I’m the One they Chasing’ and ‘Rose in the Concrete’ of course. I worked alongside Vodkilla DJ’s, Nerve DJ’s, Fleet DJ’s, MP3 Wax, and all DJ Coalitions to promote the singles”, said the musician/producer. Since then, Nicole has been featured on 3 Time Heavy Weight Champion of the World, Shannon ‘The Cannon’ Briggs’ ‘Let’s Go Champ Mix-Tape’ hosted by Gilli the Kid, AR-AB, and DJ Alamo (Fleet DJ’s). That same mixtape also featured Papoose, Skyzoo, Freeway, and Cassidy. To add to that, the musician was also featured on DJ Ron G’s ‘I Got it On Lock’ alongside the likes of Remy Ma, Troy Ave, Swizz Beatz, Yo Gotti, Asap Ferg, Freeway, DMX, Iggy Azelea, Ty Dolla Sign, Drake, Sean Kingston, Fat Joe, NORE and Fetty Wap, to mention but a few. Other notable features for the Cleveland, Ohio singer include DJ Ron G ‘The Mixtape God’ alongside Mary J Blige, Usher, Sammie Ft. 2 Chains, New Edition and Mariah Carey. Appearing on Mix King DJ Ron G ‘I’m A Winner’ Mixtape that also featured Remy Ma, Little Kim, Keisha Cole, Snoop Dog, and Wiz Khalifa was also a highlight for Nicole. “My journey has been a long one. There’s been a lot of sleepless nights and grinding but my brother always told me that when you love what you do people take notice, and I always went to the people. “My career highlights include working with DJ Ron G, receiving national radio airplay for my songs, creating relationships with the Dj’s and people that really rock with me, gracing the cover of ‘That Splash Magazine’ and being featured on hundreds of mixtapes and albums. I can’t forget winning the Battle of the Booth Contest for Conquer Entertainment and performing at the Greensborough North Carolina Coliseum and The American Airlines Arena in Miami also. In addition to that I have written songs for many artists and I was on ‘Street Soldiers’ on Hot 97 with Lisa Evers- Shout out to Tone Capone”, she said. Apart from the music, she also has a number of acting projects that will be finding their way to our TV screens in the near future. ”I have been blessed to interview major celebrities such as Vanessa Williams, Moshanda, Red Man, and many others on the internet. I was a featured actress in the Mafia movie ‘Connected’ due for release in 2019, and also had a part in the movie ‘Clinton Hill’ acting alongside ICE-T and Vincent Pastore (Sopranos), and Nas Movie ‘The Land’, said Nicole.